WASHINGTON, DC, November 17, 2010 (ENS) – Sixteen areas in 11 states have concentrations of toxic lead in the air that are too high to meet national air quality standards for lead, according to the U.S. Environmental Protection Agency. The designated areas must develop and implement plans to reduce pollution to meet the lead standards by December 31, 2015, the EPA said. Exposure to lead, even at low levels, may impair children’s intelligence, learning capabilities and behavior, and contribute to high blood pressure and heart disease in adults, scientists have determined. These 16 areas were classed as “nonattainment” areas because air quality monitoring data from 2007 to 2009 showed that they did not meet the agency’s new health-based standard. In October 2008, during the Bush administration, the EPA strengthened the nation’s air quality standards for lead tenfold to 0.15 micrograms of lead per cubic meter of air. The agency also finalized requirements for new monitors to be located near large sources of lead emissions. EPA is designating areas as meeting or not meeting the new standards in two rounds. In the first round announced Tuesday, EPA designated areas that fail to meet the standards based on air quality monitoring data from the existing lead monitoring network. EPA is currently collecting data from new monitors that began operation in January 2010. In October 2011, EPA will use data from the new monitors to complete a second round of designations that will classify the remaining areas as either in attainment, unclassifiable or nonattainment. Lead has been eliminated from gasoline, and as a result, national average concentrations of lead in the air have dropped almost 92 percent nationwide since 1980, the agency said. But the toxic metal is still released by many factories, including smelters, battery manufacturers and recyclers, utilities waste incinerators, iron and steel foundries and general aviation gasoline. Five of the 16 nonattaiment areas host facilities of one company – Exide Technologies, one of the world’s largest producers, distributors and recyclers of lead-acid batteries. Frisco, Texas made the nonattaiment list, for example, due to emissions from Exide Technologies’s battery recycling plant located in a Collin County community. The recycled lead is smelted and cast into lead-alloy bars to make new battery plates. Last year, the plant emitted about 1.67 tons of lead into the air. On November 4, Exide Technologies announced that testing for blood lead concentration is available for all residents of the City of Frisco, at the company’s expense. Another Exide automotive battery recycling center landed the city of Muncie, Indiana on the nonattainment list. This facility recycles five to seven million spent lead-acid automotive batteries per year. A third Exide facility located just northeast of Reading, Pennsylvania that manufactures and recycles lead batteries contributed to the designation of North Reading as a nonattaiment area. The company has also paid for blood lead testing in this area. A fourth Exide battery recycler is partly responsible for the inclusion of Los Angeles County in California’s South Coast Air Basin on the nonattainment list. On November 9, the South Coast Air Quality Management District adopted regulations that will bring Exide Technologies in the City of Industry and Quemetco, in Vernon into compliance with the new national lead standards by January 1, 2012. “The region will benefit from these landmark actions to improve local air quality and protect public health,” said William Burke, who chairs the AQMD’s Governing Board. 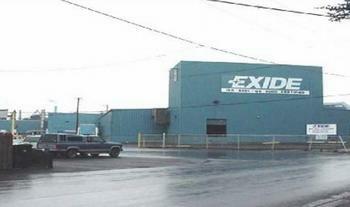 A fifth Exide facility is located in the nonattament area of Bristol, Tennessee. The world’s largest battery production and distribution center, located a few miles from Bristol Motor Speedway, this Exide plant will manufacture advanced lead-acid batteries for electric vehicles. The company won $34.3 million in federal American Recovery and Reinvestment Act funding to manufacture the new batteries with advanced carbon technology. Troy, Alabama is on the nonattaiment list due to the presence of Sanders Lead Company, a facility that recycles lead-acid batteries, scrap metal and lead bearing by-products into refined lead alloys. Tampa, Florida is in nonattainment due to emissions from Enviro Focus Technologies, formerly, Gulf Coast Lead Co.; and Tampa Lead Industries. Jefferson, Missouri also is on the nonattainment list. A lead smelter has been in operation in nearby Herculaneum for over 100 years and is currently operated by the Doe Run Company. The smelter has repeatedly violated the clean air standard for lead, and over the last 20 years, the EPA, and the Missouri Department of Natural Resources have taken multiple actions to bring the smelter into compliance. Doe Run has announced it will be closing the smelter in 2013. Cleveland, Bellefontaine, and Delta, Ohio; Iron, Missouri; Eagan, Minnesota; Granite City, Illinois; and Lower Beaver Valley and Lyons, Pennsylvania are also on the nonattainment list. No areas in Indian Country were designated as nonattainment.